The proposed project will be implemented in Udaipur dist. 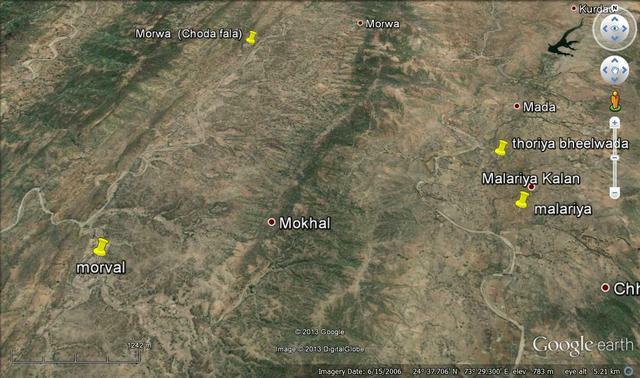 of Rajasthan in 4 tribal hamlets in Gogunda block. The villages chosen for implementation are remote, backward and are inhabited by an overwhelming majority of poor tribal (Bhil and Gameti) people. All the selected villages being in the remote areas, very few government programs have been implemented. These villages are primarily rain dependent, degraded and given the nature of the monsoons are highly vulnerable. As such all the villages and the inhabitants are in urgent need of stabilization, rehabilitation and empowerment. Around 86% (Cultivators - 74.95 and Agricultural labourers - 11.51) of the total working population is agriculture dependent, which is insufficient to support their families. Therefore, 75% families migrate in nearby areas in search of work as wage laborers. Because of the remoteness it is neglected by the Govt. departments for development. These villages settled within the Aravali mountain ranges are scattered into small hamlets of around 30-60 households each, which is a typical situation. Therefore, implementation of any development initiative is a challenge. The villages are Modwa (Hamlet Chowda Fala – 45 families), Morwal village (60 families); Village Malariya – (100 families) and village Chhali (Hamlet Thoriya Bhilwara – 60 families) where we intend to implement the community managed solar operated drinking water system. Since the area come under the drought prone area and receive low and erratic rainfall. Therefore the people from this area face acute drinking water problem especially in summer. The major source of drinking water in this area is hand bore pumps and open wells. However, in all identified four hamlets, the borewell handpumps are not functional due to break down of the hand pumps or poor water yielding especially in the summer months. Therefore, at present the women fetch the drinking water from either open wells or handpumps from far distance. As women are linked with this activity, they have to spend more time travelling long distances from their houses to source of drinking water. The situation gets even worse during summer season when the water is less and there are long queues for collecting drinking water from one available source. A few families who do not have access to a nearby bore well have to drink water from the well water, which is also shared by animals making the water source contaminated. These wells run dry in summer and people have to fetch drinking water at the distance of one to two km. from the common hand pump located in the main village. Each year women and young girls have to struggle for 3-4 hours each day just to fetch drinking water for household consumption. In order to solve the drinking water problem of these hamlet and villages, the drinking water supply scheme is proposed so that water is available near to their settlement. The assured water source will be identified through hydrological investigation and new borewell will be drilled and the solar operated pump will be installed for lifting of the water, Generally in this area the existing borewells are around 250 ft deep or more. The communities from these hamlets have decided to solve the drinking water problem through their initiative. They have approached WOTR to support the drinking water project. After completion of the drinking water project 265 households and 1325 individuals would have access to the safe drinking water. The hamlet has a primary school upto 4th standard. In the proposed project villages the total no.of students are 390; boys 234 and girls 156. In this region the state government had constructed individual toilets on a large scale, especially in the tribal area in 2008-09. However, due to the shortage of water and low quality of construction most of these toilets are not in use. Therefore, the efforts will be made to motivate the people to renovate and make use of the toilets which are constructed. The literacy levels in these villages are well below the state average (around 35%). Therefore there is very little awareness regarding government schemes available for the tribals. Those few schemes which people mostly benefit from are the MGNREGS, (Mahatma Gandhi National Rural Employment Guarantee Scheme) Indira Awas Yojana (housing scheme), etc. It is planned to promote and implement the cost effective and community managed drinking water project which would benefit the deprived and vulnerable tribal community from the selected hamlets/villages as per the village situation and their demand. It is planned to drill a new bore well as the drinking water source. A submersible pump of 2-3 H.P. will be installed on the bore well, operated on the solar system will be installed. Due to the power cut and irregular electric supply problem in the tribal belt area, It is propose to install the solar pumps. The weather in this area is generally very hot and dry through out the year.The solar operated pump would be the appropriate technology for lifting of water from the bore wells for the drinking water purpose. This would save the electric consumption and contribute to the green energy. Since there is almost zero maintenance cost to run the solar pump, hence we have planned to install the same for the bore wells. The water will be transported through the rising main pipe line of 40 ft in length and stored in the newly constructed storage tank of 8000 liters capacity. The location of the water storage tank will be near to the water source. The water taps will be installed to the water storage tank to collect the water. The drinking water project would be implemented through the Water Committee. The water committee will be formed involving women members. The Water Committee will be responsible for implementation, supervision, quality control and monitoring of activities with the support of gram panchayat and WOTR staff. The funds would be released directly to this Water Committee bank account. The committee would handle the transaction and would be responsible for maintenance of accounts. The technical and social mobilization support would be provided by WOTR staff. The Water Committee and the target group's capacity building would be done by the implementation team of WOTR. After the successful completion of the project the water committee and the gram panchayat would be responsible for the distribution of water, collection of water tax and also repairs and maintenance of the project. The project would be completed in one phase. After the monitoring of the project, the next installment funds would be released. The monitoring would be conducted by WOTR’s Regional Resource Centre situated at Udaipur. Since the tribal people are neglected by the Panchayat Raj Institutions (Zilla Parishad and Panchayat Samiti) for the developmental activities, WOTR conducted several meetings in the hamlets and villages to organize the community for the common cause like drinking water, to get the benefits/facilities of BPL schemes under Government programs. WOTR is in touch with the community and the gram panchayat since last 3-4 years. Most of the families have been migrated for the labour work in nearby towns and cities. Therefore, it was difficult to organize all households to get the consensus for future plans. Now all families are ready and have agreed to co-operate with each other to achieve the common objectives like drinking water and access to different Govt. schemes. There are already few self help groups existing in these villages which are very active and have uphold the idea of having their own drinking water system. In the initial stage, the participatory PRA was conducted in the village to understand the local situation and to collect the basic data of the village such as no. of households, population, their locations, infra structure and facilities available in the village with a view to plan and design the of the drinking water project. The women in the SHGs have decided to solve the drinking water problem and they have taken the initiative for the same. The initial planning of the project is being done through the PRA by the village community and the technical plan and estimates are prepared by WOTR staff. As the people are very poor the village community has to agree to contribute minimum 15 % of the total cost either in cash or in kind. All the legalities of obtaining NOC from the concerned government department will be taken care by the gram panchayat along with the Water Committee. After the proposal is sanctioned, two specialized trainings would be conducted by WOTR for the water committee and village community. The topics on management of drinking water and sanitation project, health and hygiene issues and post drinking water project management would be covered followed by one exposure visit to other successful drinking water project of tribal community. After the completion of the project the water committee would be responsible for the repairs and maintenance and post management of the project. The drinking water project will be implemented with the support of local Gram Panchayat. (local governance body). Except in village Morwal, there is a mixed population of upper caste, OBC, SC & ST, families from all other villages/hamlets belong to the Bhil tribal community and are living below the poverty line. The average land holding per family is less than an acre. Most of the agriculture land is rainfed. Therefore, farmers cultivate mainly maize as their staple food. A few farmers those who have some resources and are near the stream or well cultivate wheat during the rabbi season. Water borne diseases are also one of the most critical health issues prevailing in this region. Besides this due to lack of food security beyond four to five months, anemic conditions in women and children are high. Please refer the attachment excel sheet i.e. revenue generation model. Regular monitoring on a quaterly basis will be done to assess the progress of the project and work by the regional resource centre. The unit cost of 1 project is 8376.10 US$. out of which the local contribution equivalent to 15 % of the total cost is 1021.15 US$. The grant required for 1 unit is 7354.95 US$. Thus the cost of 4 project is 33504.41 US$. out of which the people's contribution is 4084.60 US$ and the total grant required is 29419.81 US$. WOTR has its its Regional Resource Centre (RRC) based in Rajasthan and has been working in the State since 2008. It has been implementing projects in the southern part of Rajasthan on natural resource management. The total area covered is more than 12 thousand hectares, in 35 villages, benefitting a population of more then 20,000. It has formed around 75 SHGs in the project villages which are active and have benefitted more then 800 women members in starting up of income generation activities, agriculture improvement, education of children, marriages, health etc. More then 20 SHGs have been interlinked with banks and have received loans. WOTR has also supported more then 10 partner NGOs in implementing NRM projects through financial, technical, managerial support or through its consultancy. WOTR has also undertaken a few CSR supported projects in implementation as well as evaluation of projects. The team comprises of technical, social, gender, agriculture and livestock experts. So far we have successfully implemented 25 decentralized drinking water projects through BPR benefitting 2151 households and 13374 individuals. Besides this we have implemented successfully the drinking water and sanitation projects in 11 villages in different 4 districts of Maharashtra benefitting 609 households and 3750 individuals. During last financial year 2010-11 we have completed drinking water and sanitation units in 64 primary/secondary schools/ Kindergarten in Ahmednagar district. Our experience is in all drinking water and sanitation projects we involve women since they are the most sufferers of the drinking water and sanitation problems and since they take the initiative to solve the same problem organizing the village community and approaching the local gram Panchayat. Therefore the implementation of the project is being done excellent as per the plan involving the entire village community. I'm surprised to read in your opening paragraph that you call the villages "backward." You later write that they "have decided to solve the...problem through their initiative." That sounds rather forward thinking to me. I'm glad to read that there will also be an effort to rehabilitate the latrines. If the weather is not sunny, how many hours/days would the water in the storage tank last? If the solar pump breaks, how long would it take to replace it and what would the people do while it is not in service? You also write that the agricultural land is mainly rain-fed, so it seems like there is significant rainfall? Is there a previous relationship with the people here? Would the funds be released in stages? Or will the full project amount be released to the water committee's bank account? What kind of oversight do you have to be sure the funds are spent according to the budget? I didn't notice a mention of someone to be employed until I looked at the attachments. How is this person selected? Does s/he live in the community? You mention a few times "different govt. schemes." Are these other projects you are leading? Or unrelated to this project? You use a lot of acronyms, and I found it hard to follow all of them. I would suggest writing out the less commonly known acronyms at the beginning of each section so the reader can refer back to it without tabbing through multiple pages. Thanks for your mail and queries. I am sorry for not giving the abbreviations for the acronyms. SHGs stand for Self help Groups. You must be familiar with the SHG concept. PRA means Participatory Rural Appraisal. It is tool to involve the people in planning process. It is intended to enable local communities to conduct their own analysis to plan and take action towards improving their own situation. BPL means Below Poverty Line. NRM project means Natural Resource Management. We are mainly engaged in promoting and implementing NRM based Watershed Development projects in six states of India. Releases of funds: After sanctioning of the project, more focus will be given on the community mobilization / organization and awareness generation about the drinking water project. This will be done through more frequent visits, rapport building, general body meetings, focused group discussions, door to door visits and conducting SHGs meetings and trainings etc. As explained in the proposal the Water Committee will be responsible for the implementation of the project. It will be main actor and implementer of the project. After sanction the project they will have to open the bank account with co signatory from the WOTR staff. The implementation of the project will be done under the supervision and control of the WOTR staff. This is the policy of the WOTR while implementing all kind of projects. The people should take the responsibility of the quality work and fund management which will lead to ensure the transparency, ownership and sustainability of the project. Otherwise there will be no difference in Government implemented projects and in our projects. The present prevailing rate of drilling bore well is about Rs. 75 per feet ($1.29) therefore the drilling cost is $388. The repairs and maintenance: The village community will be trained to take care of the solar panel. One staff/mechanic from government hand pump maintenance workshop will be trained by the solar company and some spare parts of pump will be kept with the Committee. In major problems, the solar pump could be repaired in 6-8 days and not in hours. ( It is typing mistake). Now the solar system has hybrid system i.e. even though the solar system failure, the hand pump can be used manually. We have been working in the nearby villages on watershed management for last five years. People in the proposed DRINKING WATER project area have witnessed the way we work with people. Looking at the impacts people have got through self initiative from the watershed managed villages has motivated people in the proposed DRINKING WATER villages to take up initiative and solve their drinking water problem! If the weather is not sunny, how many hours/days would the water in the storage tank last? The rainy season in the proposed DRINKING WATER villages is for four months, i.e. from June to Sep. The total rainy days are only 26 in the whole year. Therefore there is ample of sun shine days in the year, with temperatures reaching 45 deg. Celsius. during summer seasons. The capacity of the water storage tank is designed in such a way that it will be sufficient for small number of families. If the solar pump breaks, how long would it take to replace it and what would the people do while it is not in service? The unit is such that even if solar pump does not work, the people will still have option of lifting water with the hand pump. The solar pump can be repaired within 6-8 hours if break down. You also write that the agricultural land is mainly rain-fed, so it seems like there is significant rainfall? The area is mountainous, hence highly undulating. The major crop is maize, which is rain dependent. The average rainfall in the area is 600 mm. which is highly erratic. As such there is no direct relationship in the DRINKING WATER villages except with the "Sarpanch" (village head) and the members of the village level committees. They all have visited our watershed managed villages and have known us since then. They have been requesting us to undertake similar projects in their villages also. This is how we are known in these villages. The funds would be released to the Drinking Water Committees bank account of each village separately in two- three instalments.as per the progress of the work. Before releasing the second installment the monitoring will be conducted by the Regional Recourse Centre. The committee will have to conduct meeting and pass a resolution for withdrawal of money. WOTR staff (Engineer) will be part of this meeting to ensure the quality of work, budget requirements etc. The person who will be look after the daily operations of the solar pump will be from the village itself and will be selected by the people in the village meeting. There are other Govt. schemes such as Employment Guarantee scheme & some other rural development activities. Though the area is backward and neglected by the government line departments, however because of the drinking water project, the village people will be organized and they will have regular meetings and interactions, so that they can discuss other their issues / problems. During these meetings our field staff also guides them about govt. Schemes and try to link with local village level governance. We will take care to minimize usage of acronyms. If you need any details of any specific acronym, may please feel free to ask. Hope this explanation will satisfy your queries. If you require any more information please don’t hesitate to write. Hemant, Co-coordinator, Regional Resource Centre, Udaypur, Rajastan. What is the methodology for such quick repairs? I'm surprised a solar pump could be repaired in 6-8 hours. Is it a locally trained person? A circuit rider system? Replacement parts are that close by? Have you ever had a negative experience releasing sums of money to the project beneficiaries? You are transferring large sums of money to people you have had little contact with before meeting to carry out the project. I suspect it's a usage thing, but in an answer above you again use the word "backward." As a number of users and funders of PWX are in North America, I'd like to share with you that that is a word with a rather negative connotation here. I am not sure what the acronyms SHGs, NRM projects, PRA, and BPL stand for. I read all of the grant and did not see a place where they were defined. Perhaps I missed it. How is it that a 300 foot well only costs $388 to drill? This is a remarkably inexpensive project. Have gone thru your proposal and have a few questions. 1. Could not find distribution system (or its costs) so please expand on the water points/taps that will be available. Will they be near the OHT? If not, won't the piping to each standpost involve costs? I was looking for that in the budget. What do you estimate the distance to get water for the furthest family will be? 2. You have answered time for repair to be 6 hours. What is your experience of failures? What is the average time for the first failure to happen? What is the average cost of repair? Will the savings accumulating in the fund cover the average cost of first repair at that time? 3. You mention that there will be a backup handpump option. How close to the electric pump? The reason i am asking is that there are ways to introduce contaminants with more connections to the aquifer. Each pipe provides shortcuts (inside and outside along the casing, since the top block can never be waterproof) for air and pathogens to travel. 4. Have you considered wind-powered pumps? Either wind->electricty->mechanical power or wind->mechanical power. Hi, thanks for your proposal. Can you please explain whether/how the water source will be re-charged? Who will be responsible for incorporating re-charge methods? Thanks for your comment. The clarification is as under. In our previous response to your queries, we had mentioned that since southern Rajasthan has more rainfall i.e. about 600 mm. therefore, rainwater is generally harvested in recharge structures such as open wells and bore wells. In comparison to your desert area, the’ Roof Rainwater Harvesting System’ would not be required in southern region of Rajasthan. Generally, in order to tap the underground water in the southern region area the depth of the bore well is around 250 feet deep. It is true that the watershed development program is the solution for the drought proofing and to raise the ground water table. Therefore, while implementing the drinking water project the efforts will be made to build the capacity of the people to make them aware about the watershed works and to link with existing government schemes, such as National Employment guarantee Program to undertake the water harvesting structures to strengthen the water sources. At present out of four project villages we have selected Modhava village for implementation of the watershed development program under the other funding agency. The remaining three villages also will be selected in the next phase for watershed development by us under support of other funding agency. While studying the project budget, I observed that the chosen pump is suitable for 35m total head, the storage tank height is 40ft (10.3m) and the HDPE pipe is 40 m. So, what is the expected water table depth? Is it less than 24m? You mention 240 feet above, so need clarification. Secondly, the pump is rated at 1400W, but the solar panel power is just 1380W. This will cause the pump to run at lower wattage most of the time with reduced efficiency Esp. in non-peak solar hours (morning, evenings, winter). The capex is also higher because of this. Shrikant has designed a system that uses battery stabilized lower wattage pump; the capex will reduce by Rs 15,000 to 20,000. Further, the system can support community lighting at night from the stored energy in the battery. We hope you will consider his system for the project. Dear Shrikant, We have got the specifications designed from a company which deals in such systems. Therefore I need to get the querry resolved from the company expert and then provide you with the feedback. In the mean while can you give us the details of his design and costings of his system which cater to the needs of the village people? Thanks for your proposal, very innovative and interesting. Our question is on the basic approach that you have taken up. Why do you think a bore well will be more effective then rainwater harvesting. Coming from the same state, we have that opinion. Let us understand the basic difference between your area, which is a desert area and the southern Rajasthan, which is hilly area. The rainfall in desert region is around 150 mm and rainwater is harvested usually by collecting it in the Tankas for domestic purposes. Whereas in our area rainfall is around 600 mm. Rainwater is usually captured into recharge structures such as open wells and borewell. Rainwater harvesting can be done or rather should be done to harvest rainwater for maximum benefit. In our area this is done by undertaking soil and water conservation measures like farm bunding, check dams, nala bunds which is mostly subsurface. Construction of structures alike Tanks are not possible or do not traditionally suite conditions like ours. Regarding roof top rainwater harvesting, the houses are mostly of manglorean tiles or have thatched roofs wherein roof top rain water harvesting is not possible at large scale. Hence people dig bore wells at a depth of 200-300 ft for drinking water purpose as they provide comparatively potable water then open wells which are usually 40-60 ft. When i look for annual rainfall in Udaipur i see about 700+mm. Are you having data that it is only 150mm in your hamlets? The proposal of helping tribal people is highly appreciated. Solution suggested is surely a micro level temporary solution, which needs to be aptly implemented in case of worse case scenarios to avoid ill health for time being. However there are few question related to macro level sustainability that concerns. Solution to draw ground water will work for few months/years depending upon the rate at which ground water depletes in the region. Lot of borewells have turned useless now as the ground water level is going down at alarming rate. Such quick solutions will consume precious resources underneath which has taken ages to filter. Also we might be 'spoiling' tribal people in the short term? and then when the groundwater dries up, the situation would be even worse off. Kindly think of permanent alternatives that are local and easily buildable by local people using local material and natural resources. Udaipur region has better rainfall compared to other regions in Rajasthan. Please think of solution, applied in many parts of Rajasthan as well as in similar terrain situation in other parts of country, using this naturally available resource. Kindly identify, research and elaborate all possible solutions. Moreover, hilly terrain might work out to be beneficial in terms of capturing water at higher level and gravity fed to community. Test has been conducted proving rainwater has much less Hardness and TDS; and much more healthier compared to borewell water, if considered for longer period. Many solution in past have been employed by their forefathers locally, which needed minimal resources and local people were engaged to it, owning it and feeling responsible in case maintenance required. Please bring this wisdom back to surface and practice it holistically. With this approach, any funding that is generated from outside, will percolate into the tribal society benefiting them economically and socially. Also it will make them SELF-SUFFICIENT. To supplement Saurin's observations, what needs to be mentioned is that we have not succeeded to address consumption issues. When we provide 'unlimited' and 'regular' supply people (urban, esp. and rural too) forget seasonality and start 'unsustainable' patterns of consumption. As a city dweller, it is important to point fingers at self first and also recognize that we are the role models (something i have learned from visiting WOTR projects). So we are in a very difficult situation where we offer help and development either putting people on unsustainable paths or we say 'don't do as we do' using double standards. Advice would be to help these people remain connected to water cycles and be sustainable (and healthy as groundwater data suggests) if we can. We do agree on the comment made by Mr. Suvrin Shah on finding long term and self sustaining solutions. We are already implementing some tried and tested means of soil and water conservation techniques through watershed activities which help in making the villages self sustaining in resources, especially water. Funding is being sought for such activities in the BPR project villages also. Secondly, for judicious use of water, WOTR is creating awareness through a technique "Water Budgeting" wherein people understand the water availability of their village and then try to budget the demand and supply equation of water in their villages. But this is not proposed as of now in the BPR villages as it requires many other interventions both financial and non-financial. What an interesting project. Etta Projects is also piloting a solar powered water project this year, so it’s great to learn from other organization’s efforts. Many people has shared concerns regard theft and vandalism of the solar panels. Are you planning on installing a security fence, a steel pole or using tamper proof hardware? Where are you purchasing the solar materials? Is this technology commonly used in the area? It would be good to have more information regarding water usage and the amount of available water produced from the water source. Also, it seems like your tank may be too small. Can you help me better understand the water system design, including how many water taps will be installed? How are you addressing the need for families to conserve water during the dry season? Thanks, and I look forward to your responses. Dear Katie chandler of Etta Projects, Please Sorry for wrongly inserted two times the 2nd ans , we will responding your question shortly. Please Sorry for wrongly inserted two times the 2nd ans , we will responding your question shortly. Q. 1	What an interesting project. Etta Projects is also piloting a solar powered water project this year, so it’s great to learn from other organization’s efforts. Ans. 1	We have discussed this issue with the Village Development Committee (VDC). They have suggested us that we install the panels over the roof of the houses of one of the members who is near to the water source. This will avoid any mishap. We have agreed for the same. Q. 2	Where are you purchasing the solar materials? Is this technology commonly used in the area? Ans. 2	Solar materials are now easily available all over India. We are purchasing the same from the company of repute in installation of such products. The solar energy operated pumps are commonly used in India. Q.3	It would be good to have more information regarding water usage and the amount of available water produced from the water source. Also, it seems like your tank may be too small. Can you help me better understand the water system design; including how many water taps will be installed? Ans. 3	We have selected such water sources which have been suggested by the villagers that are being used by them for many years. The tank is designed as per the requirement of that hamlet i.e. 50 liters per person day. The tank will be filled at least twice, once in the morning and once in the evening as per requirement. This will also automatically bring wastage under control if you have been giving them water for 24 hours. The water will be stored in the water storage tank. At least three to four tab connections will be provided to the water storage tank. This will be used as common stand post to collect the drinking water. Q.4	How are you addressing the need for families to conserve water during the dry season? Ans. 4	As explained above, the water will be released twice in day i.e. morning and evening. One valve will be provided to the water storage tank to regulate the water. The water will be released for one hour in the morning and one hour in the evening at fixed timing. During that time only people can collect water from the stand post. I like your idea of trying to ensure that their toilets are repaired/upgraded. However, these toilets are often hard to upgrade along with their septic tank. Have you done a survey? How many are currently in use? What will be the cost of repair/upgrade? Will the sewage be properly contained? Can the people afford this? Is there enough water for flushing? Should dry | eco-san toilets be introduced? What is your estimated effort/budget for these activities? You have put 800 people getting sanitation as one of your goals, that needs strong effort and resources. Thank you for your comments. The explanation is as follows. 1. Distribution System: As per the plan there will be no separate distribution system. The water will be lifted from the bore well and will be stored in the newly constructed water storage tank. The water distribution tap will be connected to the water storage tank through water intake pipe. One sluice valve will be provided to the water intake pipe to regulate and control the water supply tap pipe. The people will collect the water from the water storage tank through these taps. So far we have not conducted any detailed survey of the status of toilets such as condition of toilets, renovation budget, construction cost of new toilets etc. In the initial discussions and through the Rapid Rural Appraisal (RRA) and Participatory Rural Appraisal (PRA) information has been collected under the Sanitation campaign program of the state government initiatives. Most of the households have constructed individual toilets. However, due to shortage of water and poor quality of work the toilets are not being used by the people. Now we have planned to solve the drinking water problem as first priority. While implementing the drinking water project we will focus on health and hygiene issues and will try to motivate the people to repair old toilets and construct new toilets under some other funding source. Out of these proposed four project villages, we have selected one village (Modwa) for integrated watershed development program and have submitted the proposal to other funding agency for sanction. Similarly, we have planned to take up the watershed development works in remaining villages also in the next phase. Thus there will be constant rapport and support from WOTR to follow up the sanitation activities. One thing i have learned from several NGOs (including WOTR) is that water is always in demand, and sanitation less. So if sanitation first is a condition for getting water, it is likely to be more adopted and successful. Do you agree? Would pushing sanitation first be easier than providing water first and then trying to get community to focus on sanitation? If you are not sure, maybe one or two of the villages can be a test case. As we have learnt "Necessity is the mother ...." . What guides to the success of any project is whether there is any demand felt by the people. Here in our area, demand for sanitation is there, but through our eyes only. People as of now do not see Sanitation as there basic requirement as they have places earmarked specially for open defecation. Secondly, neither are the people aware of the ill effects of open defecation. The scheme which the govt. has already implemented has turned out to be utter wastage of money where they have constructed toilets without taking into consideration of the demand as well as without creating any awareness on the same. Therefore pushing sanitation first would not work as of now. Hence the focus is first to secure their need of drinking water and simultaneously make concerted efforts to generate awareness on use of toilets, and then may be construct/repair toilets, which might be a very slow process. The cost of the project is reasonable and the need seems apparent. El Porvenir believes that sanitation must accompany water projects in order to improve health, education, and economy; much discussion was around that topic. It seems the people there are not interested, but I agree with Rajesh that maybe sanitation should come before water. I really like the project and the focus on tribal communities. Unfortunately, I feel that some important information was left out of the proposal that proved a sustainable project and gave the reviewers an in-depth understanding of how it functions. This project will make people aware regarding government schemes and also reuse of existing resources will be mobilized. To be honest, i am very confused as how to rate this proposal since i know WOTR for nearly 10 years and have learnt much from them and my instinct is to trust their plan and its execution. However, i really want clarity into their decision to not develop the shallow aquifer by using their truly world-class experience of watershed development to create shallow wells filled with good quality water that will last almost the entire year. Since the community has shallow wells that dry up in the summer months and whose quality is not the best, a better plan, it seems to me, would be to improve them, recharge them and protect their water quality. WOTR is extremely capable of these activities. My thoughts are reinforced after seeing the pictures of the hills and open well and the peer review. This plan is much more high-tech and potentially likely to be unsustainable (if their shallow aquifer cannot survive with 600mm of rain, a deeper well is likely to also run out since it is also recharged by the same rainfall amount). Would also like the need to be better articulated. The pictures of the open well and women fetching 'potable' water could be from a completed project! Any other benefits like agriculture based on the new water supply? And sanitation seems like an after-thought rather than fully integrated into the plan and approach (explain why it should not be done first). And explain why we should not take the trouble of introducing dry toilets in this area - instead of them starting to use good potable water from a deep aquifer for toilets. The technology option as to the capacity of the solar panel, the motor current requirement, and the depth have a few questions. In addition, dust on the panel is an issue, which can impact energy generation. Finally, their sustainability plan lacks any indicators, and many of their past projects lack the quarterly visit reports post implementation. While i feel that the current plan is likely to succeed, they have not convinced the reviewers that it is the best option.